Reno, Nevada. Every year in September, an array of original planes converge on Stead Airport to take part in one of the world’s great aviation venues: the famous Reno pylon races. Flying at dizzying speeds, these aircraft face off on circuits traced out in the desert, just a few feet off the ground. 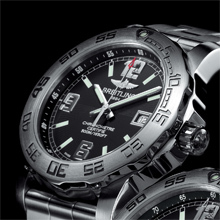 Their motto: “Fly low, go fast, turn left.” As a partner of all the fi nest hours in aviation, Breitling is the main sponsor of this event that is unique in the world – thereby pursuing its mission to perpetuate the competitive spirit, the taste for performance and the fi erce quest for victory. Equipped with a Breitling SuperQuartz™ movement ten times more accurate than ordinary quartz, the Colt Chronograph is water-resistant to a depth of 300 meters (1,000 ft). It features a 1/10th of a second display, a split-second hand and a fast timezone-change system that avoids any loss of precision in counting the minutes. On the design side, the generous 44 mm diameter perfectly highlights the powerful and refi ned style of the new Colt with its case featuring alternating polished and satin-brushed surfaces and its bezel carrying original numerals. For all devotees of top-fl ight achievements, Breitling has equipped the Colt 44 with the best of its electronic technology in the form a SuperQuartz™ caliber ten times more accurate than standard quartz movements. The polished and satin-brushed finishes highlight the distinctive shape of the case and bezel. 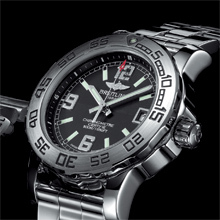 The sturdy construction, the screw-locked crown and the thick sapphire crystal (glareproofed on both sides) guarantee exceptional water resistance to a depth of 500 meters (1,650 ft). Designed for women wishing to combine ultra-sporty character with elegance, the Colt 33 is distinguished by its 33 mm diameter and its entirely polished case with a satinbrushed upper bezel surface. The feminine touch is accentuated by an optional gemset bezel. The dials come in a choice of several refi ned shades. The high-precision Super-Quartz™ movement, chronometer-certifi ed by the COSC, is housed within a sturdy steel case that is water-resistant to 500 meters (1,650 ft) — a unique feat for a ladies’ watch. Movement: Caliber 73, officially chronometer-certified by the COSC, thermocompensated SuperQuartz™, fast timezone adjustment. 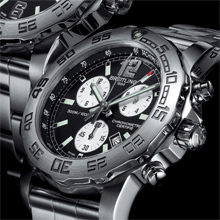 1/10th of a second chronograph, 60-minute and 12-hour totalizers with split times (split-second hand). Calendar. Case: Steel. Water-resistant to 300 m (1,000 ft/30 bars). Screw-locked crown. Unidirectional ratcheted rotating bezel. Sapphire crystal, glareproofed on both sides. Diameter: 44 mm. Dials: Volcano Black, Stratus Silver, Gun Blue. Straps/bracelet: Leather, rubber Ocean Racer (perforated), rubber Diver Pro (with raised central ridge)/Professional. Movement: Caliber 74, officially chronometer-certified by the COSC, thermocompensated SuperQuartz™. Battery end-of-life indicator. Calendar. Case: Steel. Water-resistant to 500 m (1,650 ft/50 bars). Screw-locked crown. Unidirectional ratcheted rotating bezel. Sapphire crystal, glareproofed on both sides. Diameter: 44 mm. Straps/bracelet: Leather, rubber Ocean Racer (perforated), rubber Diver Pro (with raised central ridge)/ Professional. Movement: Caliber 77, officially chronometer-certified by the COSC, thermocompensated SuperQuartz™. Battery end-of-life indicator. Calendar. Straps/Bracelet: Leather, rubber Diver Pro (with raised central ridge)/ Professional.